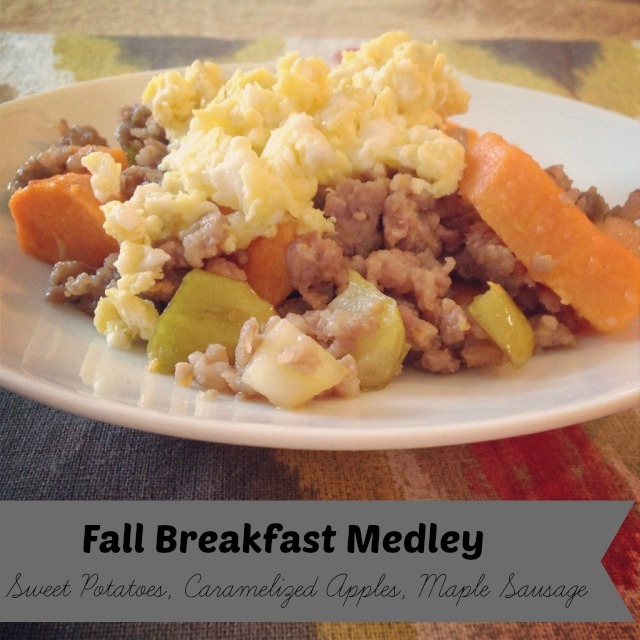 You’ll fall for this Fall Breakfast Medley. Made with maple sausage, sweet potatoes and caramelized apples, it’s the perfect sweet and salty breakfast for a crisp, fall morning. It’s quick and easy to make, so weekend mornings can be spent watching football and lounging on the couch instead of working away in the kitchen. Cook sausage as directed on package with the onion. Drain and set aside. Peel sweet potatoes and cut into 1/2 inch pieces. Place in medium saucepan and cover with water by about one inch. Stir in 1 tsp. of salt and bring to a boil. Reduce heat to medium-low and let simmer for 10-12 minutes until tender. Meanwhile, melt butter in large skillet over medium heat. Stir in sugar until combined and the sugar starts to dissolve. Add apples and cook for 8-10 minutes (stirring frequently), until tender and golden brown. It should start to smell caramelized. Set aside on low heat to keep warm. Drain potatoes and combine with sausage mixture and apples. Mix well and top with eggs.